Vue is a progressive framework for building user interfaces. Programmatically, vue has similarities with react and angular. The slight difference is that the vue is very small with a size of 16KB for the production version, so the load time is very fast and has a very high runtime performance. If both use as a framework for building user interfaces, what is the difference with jquery? even using jquery is already very effective. The main difference is that using vue framework is easier, faster and more efficient. In some cases if someone is able to complete a project in 24 hours using jQuery, then migrating to vue only takes 12 hours with more readable and efficient coding. Should we leave jQuery? Of course not, vuejs is not superman, in some cases using jQuery is even more effective. Migration here is not interpreted to replace it entirely, basically, jQuery and Vue.js are 2 different concepts. What makes Vue Js 2 more attractive than other frameworks? Vue is not always SPA (Single Page Application), Vue is designed more flexible. Vuejs can be used partially, not overkill SPA. For example, only on certain pages, on the login feature, user profile, dashboard or in certain parts that are needed (Jquery Minded). By default, vue uses the concept of one-way data binding, but vue also features two-way data binding. With the pyramid scheme reversed (parent to child), it will be easier to adjust the data flow, especially in large applications. How to install it is easy, just like jquery you only need to add a script to the HTML page. 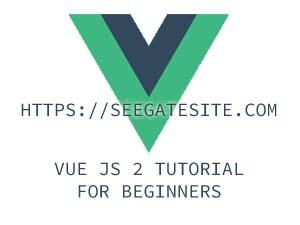 We will try to apply vue js 2 to the following simple application so that we can easily understand how vue js 2 works. Thus my short article about Acquainted And Learn About VUE JS 2 Tutorial For Beginners. ← Azoncast Plugin The Best Auto Amazon WordPress Article, PROVEN!! !